Morbegno is the first city that meets those arriving from Lake Como and takes the long Valtellina. Town with a beautiful historic center, industrious and well connected to Lecco and Milan, Morbegno is located at 260 meters of altitude and has 12,500 inhabitants. 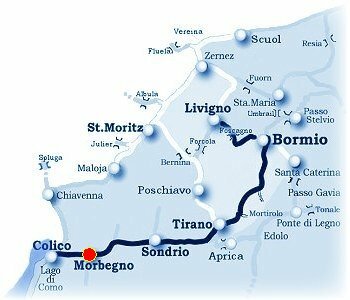 Near Morbegno passes the state road SS38 which leads to Sondrio in 27 km, Tirano 58 km and Bormio 90 km, while Chiavenna is 40 km, Sankt Moritz 82, Lecco 52 and Milan 116. In Morbegno also passes the Trenord railway that connects Milan to Tirano, where it crosses the Rhaetian Railway of the famous Red Train and other transport services (click).